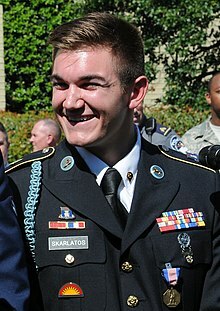 Aleksander Reed Skarlatos (/skɑːrˈlɑːtoʊs/; born October 10, 1992) is a French-American actor and US Army National Guard soldier who, along with fellow Americans Spencer Stone and Anthony Sadler, a Briton and two Frenchmen, stopped a gunman on a Paris-bound train travelling from Amsterdam via Brussels in August 2015. He has been awarded the United States Army's Soldier's Medal from U.S. President Barack Obama, and has received France's highest decoration, the Legion of Honour, from French president François Hollande as well as the medal of Arras, France. Skarlatos competed on season 21 of ABC's Dancing with the Stars with pro dancer Lindsay Arnold, and finished in third place. Aleksander Reed Skarlatos was born in Castro Valley, California, to Emanuel Skarlatos, a Greek immigrant who arrived in the United States as a child, and then-wife, Heidi Hansen. His step-parents are Karen Skarlatos and Tom Hansen respectively. He grew up in Sacramento County, California, where he first met Spencer Stone and Anthony Sadler while attending school in Fair Oaks, California, their friendship continuing into adulthood. All three men are described as sharing "a deeply religious background and a belief in service to their community" and are Christian. Skarlatos graduated from Roseburg High School. Skarlatos joined the Oregon Army National Guard in 2012 achieving the rank of Specialist. He completed a nine-month deployment in Afghanistan with the 186th Infantry Regiment, 41st Infantry Brigade Combat Team of the Oregon Army National Guard in 2015. The acting adjutant general of Oregon has referred to Skarlatos as "a true citizen soldier who displayed the courage each of us would hope to find in ourselves." Spc. Skarlatos had reenlisted for an additional two-years a month prior to the terrorist event on a French train in 2015 and left military service in November 2017. In October 2016, it was announced that Skarlatos, Spencer Stone and Anthony Sadler would make an appearance on Who Wants to Be a Millionaire as a part of the show's special "Hometown Heroes" week which would premiere on October 31, 2016. He ran for Douglas County Commissioner in his home state of Oregon in the 2018 U.S. midterms, but lost to businessman Tom Kress. In September 2018, Skarlatos became a naturalized French citizen, along with Stone and Sadler. A naturalization ceremony was held in Sacramento in January 2019. On August 21, 2015, Skarlatos and two friends from his childhood home of Carmichael, California, were traveling together during a vacation in Europe. He was recently back from Afghanistan, and had been traveling in Germany and the Netherlands and was to travel to Greece. Skarlatos was sitting in a window seat of Thalys train 9364 from Amsterdam bound to Paris via Brussels. A 25-year-old Moroccan man, believed to be Ayoub El-Khazzani, was in train car No. 12, armed with an AKM assault rifle and equipped with 270 rounds of ammunition. Several people tried to stop the gunman, but failed to do so. Skarlatos' friend, 23-year-old Spencer Stone, attacked the gunman first and was injured while trying to subdue him. Skarlatos took action and seized the assailant's rifle, beating him in the head with the muzzle of it until he was unconscious. United States Defense Secretary Ash Carter awards the United States Army Soldier's Medal to Skarlatos (second from the left), an army specialist; the United States Air Force Airman's Medal to Spencer Stone (third from left), an airman first class; and the United States Department of Defense Medal for Valor to Anthony Sadler (fourth from left), at a ceremony in The Pentagon courtyard on September 17, 2015. After the attack, on August 22, 2015, Skarlatos and his friends received international attention for their actions in thwarting the attack. French president François Hollande awarded Skarlatos, his friends Spencer Stone and Anthony Sadler, as well as British businessman Chris Norman, France's highest decoration, Knights of the Legion of Honour (Chevaliers de la Légion d'honneur). Hollande said the men "faced [off] with terror" and that they "gave us a lesson in courage, in will, and therefore in hope". French Interior Minister Bernard Cazeneuve praised them for their bravery, as well as British Prime Minister David Cameron. The White House expressed gratitude for "courage and quick thinking of several passengers, including U.S. service members, who selflessly subdued the attacker..." U.S. President Barack Obama telephoned the three Americans, thanking them for their heroic actions. General Philip M. Breedlove of the U.S. European Command in Stuttgart, added his voice, calling the three Americans heroes for their actions which "clearly illustrate the courage and commitment our young men and women have all the time, whether they are on duty or on leave." Kevin Johnson, mayor of Sacramento, California, held a parade to honor Skarlatos, Sadler, Stone, and the victims of the September 11 attacks. Megyn Kelly of Fox News Channel's The Kelly File, asked Skarlatos whether he had a different appreciation of what happened when the World Trade Center collapsed. "I feel so much more connected to terrorist attacks and things like that and victims of terrorist attacks," said Skarlatos, "That easily could have been us if any one of six or seven things went a different way." Skarlatos was announced as a competitor in season 21 of Dancing with the Stars. He was partnered with professional dancer Lindsay Arnold. He said that he was inspired to participate on the show by Noah Galloway, a soldier who was on the previous season of the series. Skarlatos and Arnold made it to the finals of the show and finished in third place. 8 Contemporary/"Holding Out for a Hero"
1 Score given by guest judge Alfonso Ribeiro. 2 This week only, for "Partner Switch-Up" week, Skarlatos performed with Emma Slater instead of Arnold. 3 Score given by guest judge Maksim Chmerkovskiy. 4 Score given by guest judge Olivia Newton-John. Received the bravery medal of the city of Arras, France. ^ "Terror Train Hero Alek Skarlatos Oregon Shooting Hits Close to Home ... Bolts Out of 'DWTS' Rehearsal". TMZ. October 1, 2015. Retrieved October 2, 2015. ^ "Guardsman to get Soldiers Medal for subduing gunman on train". National Guard Bureau. August 26, 2015. Retrieved September 6, 2015. ^ a b Miner, Collin (August 27, 2015). "Alek Skarlatos: 'Good to be home with family'". KOIN6. Retrieved September 3, 2015. ^ "Obama lauds 'train heroes' at White House". Yahoo! News. AFP. Retrieved September 18, 2015. ^ "Alek Skarlatos, 2 other Americans receive France's top honor for stopping armed attacker". The Associated Press. The Oregonian. August 24, 2015. Retrieved September 3, 2015. ^ "Oregon's Train Hero Cast in ABC's New 'Dancing' Cast". Oregon Public Broadcasting. September 2, 2015. Retrieved September 3, 2015. ^ a b Carey, Stacy (September 6, 2015). "Who is Alek Skarlatos of 'Dancing with the Stars'?". inquisitr. Retrieved September 6, 2015. ^ a b Bailey Jr, Everton (August 21, 2015). "Oregon soldier calls from France to say 'he and his friend took down a terrorist,' dad says". The Oregonian. Retrieved September 3, 2015. ^ a b c "3 Americans praised for subduing gunman on European train". Associated Press. Newsday. August 22, 2015. Retrieved September 4, 2015. ^ Sangree, Hudson. "Carmichael childhood, faith unite friends who stopped train attack". The Sacramento Bee. Retrieved June 6, 2016. ^ Cameron Smith (2015). "Oregon has a community of veterans that continue to serve" (Veterans Day ed.). Oregon Department of Veterans' Affairs. p. 2. Retrieved April 18, 2018. ^ Lindsay Adams-Spinner ARNG G1 STRATCOMM (October 12, 2015). "Guardsman honored for subduing gunman on train in France". g1arng.army.pentagon.mil. US Army National Guard. Archived from the original on October 2, 2016. Retrieved April 18, 2018. ^ National Guard Bureau (August 26, 2015). "Guardsman to get Soldiers Medal for subduing gunman on train". www.army.mil. US Army. Retrieved April 18, 2018. ^ Charlsy Panzino (February 4, 2018). "Heroes-turned-actors: 3 stars of 'The 15:17 to Paris' talk about their roles of a lifetime". armytimes.com. Sightline Media Group. Retrieved April 18, 2018. ^ Katie Lange (February 8, 2018). "DoD Assets Set Scene for Heroes in '15:17 to Paris'". Defense Media Activity. www.dodlive.mil. Department of Defense. Retrieved April 18, 2018. ^ Fletcher, Ed (October 28, 2016). "Millions await French train heroes". The Sacramento Bee. Retrieved October 30, 2016. ^ Cegavske, Carisa (May 15, 2018). "Alek Skarlatos will run for Douglas County commissioner". Retrieved November 2, 2018. ^ News-Review, CARISA CEGAVSKE Senior Staff Writer The. "Tom Kress defeats Skarlatos in race for Douglas County Commissioner". NRToday.com. ^ "Three Sacramento men who stopped terrorist attack on train naturalized as French citizens". The Sacramento Bee. ^ "Carmichael childhood, faith unite friends who stopped train attack". sacbee. Retrieved October 31, 2015. ^ "Alek Skarlatos' Terrorist Takedown: It Was Pure Instinct" (video). AssessHollywood. Retrieved September 11, 2015. ^ a b Barrett, David (August 23, 2015). "Revealed: The mystery man who tackled AK-47 assault rifle from train gunman". The Daily Telegraph. Retrieved September 4, 2015. ^ Gray, Melissa; Meilhan, Pierre (August 22, 2015). "Americans who thwarted train attack praised for 'exceptional courage'". CNN. Retrieved September 4, 2015. ^ Mikelbank, Peter (August 22, 2015). "'Wrong Place, Right People': U.S. Servicemen, Passengers Speak Out after Foiling Possible Terror Attack on European Train". People. Retrieved September 4, 2015. ^ Baker, Keiligh; Baker, Darren (August 22, 2015). "Crew on Paris-bound train 'barricaded themselves in their staffroom and locked the door as Kalashnikov-wielding terrorist went on the rampage – leaving PASSENGERS to take him down'". Daily Mail. Retrieved September 4, 2015. ^ NOSSITER, ADAM (August 22, 2015). "A Shot, a Glimpse of an AK-47, and U.S. Servicemen Pounced on Gunman on Train to France". The New York Times. Retrieved September 4, 2015. ^ a b c Chrisafis, Angelique; Kassam, Ashifa (August 24, 2015). "French train attack men given Légion d'honneur for 'preventing massacre'". theguardian. Paris. Retrieved September 4, 2015. ^ "France train shooting: Hollande thanks 'heroes' who foiled gunman". BBC. August 22, 2015. Retrieved September 4, 2015. ^ Ellis, Ralph; King, Jessica; Dailey, Peter; Seshadri, Archith (August 22, 2015). "2 members of U.S. military stop Islamist attacker on train in Belgium". CNN. Retrieved September 4, 2015. ^ Karimi, Faith (August 23, 2015). "Train shooting heroes: The men who helped avert a massacre in Europe". CNN. Retrieved September 4, 2015. ^ "Breedlove: U.S. Troops 'Heroes' in Train Attack". Stuttgart, Germany: United States Department of Defense (DoD). Retrieved September 4, 2015. ^ Ortiz, Gamaliel (September 3, 2015). "Mayor releases details for parade honoring Sacramento heroes". KCRA. Retrieved September 5, 2015. ^ "French train heroes discuss 9/11 during Sacramento parade in their honor". ABC7. Sacramento, California. September 12, 2015. Archived from the original on September 13, 2015. Retrieved September 13, 2015. ^ "Dancing with the Stars Season 21 Cast Announcement". ABC. September 2, 2015. Retrieved September 5, 2015. ^ Glines, Carole (September 11, 2015). "Terror train hero Alek Skarlatos was inspired to do 'DWTS' by last season's courageous star Noah Galloway". FOX News. Retrieved September 11, 2015. ^ KATU News (staff) (August 25, 2015). "Oregon hero, Spc. Alek Skarlatos, to be awarded Soldiers Medal". kval.com. Eugene, Oregon: Sinclair Broadcast Group via KVAL 13. Retrieved April 18, 2018. ^ a b Meredith Worthen (February 8, 2018). "Meet the Real Heroes of '15:17 to Paris'". biography.com. Retrieved April 18, 2018. ^ KATU News (staff) (February 17, 2016). "Governor presents Spc. Skarlatos with Oregon Distinguished Service Medal". katu.com. Portland, Oregon: Sinclair Broadcast Group via KATU 2. Retrieved April 18, 2018. ^ "Individual Awards - The EANGUS Humanitarian Medal". eangus.org. Retrieved April 18, 2018. ^ John Harris (April 30, 2016). "EANGUS Humanitarian award winner Alek Skarlatos". msncoa.org. Retrieved April 18, 2018. ^ "United Voice for the National Guard". ngaus.org. Retrieved April 18, 2018. ^ "Valley Forge Cross for Heroism". ngaus.org. Retrieved April 18, 2018. ^ "Award Recipients (1998 - 2017)". ngaus.org. Retrieved April 18, 2018. Wikimedia Commons has media related to Alek Skarlatos. Alek Skarlatos on IMDb . This page was last edited on 1 April 2019, at 19:59 (UTC).